First graduating class of the MSc (Appl Sci) in Food Science were conferred with their degrees on December 12, 2007. Back row: Kostas Christodoulou (Greece), Liam O'Connell (Ireland), Prof Paul McSweeney, Antonio Sullo (Italy). Front row: Claire Murphy (Ireland) and Jie Zhang (China). Not shown are Paul Kinahan (Ireland) and Leonardo Cornacchia (Italy). Second graduating class of the MSc (Appl Sci) in Food Science (2007-2008). 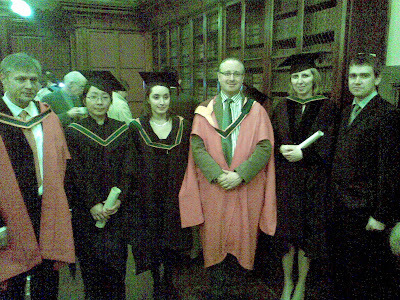 From left to right, Prof YH Roos (Dean), Dandan Xie (China), Caroline Furlong (Ireland), Prof PLH McSweeney (programme coordinator), Agnieszka Gdanska (Poland), Conor Coughlan (Ireland). Not shown is Nadia Hartopoulou (Greece). Welcome to the MSc (Applied Science) in Food Science, a one-year masters degree programme offered by the Department of Food and Nutritional Sciences, University College Cork. The MSc (Applied Science) in Food Science is a one-year taught post-graduate programme in Food Science consisting of 90 ECTS credits including library and laboratory research projects (~40 credits). Courses (~50 credits) will include modules in research methods, land advanced courses in established and emerging areas of Food Science. Candidates must normally be holders of an honours BSc degree, or equivalent, in Food Science, Nutritional Sciences, Microbiology, Biological or Chemical Sciences, Food Business or related fields. UCC has a history of nearly a century of teaching and research in the Food Sciences and now is amongst Europe’s largest multidisciplinary education and research institutions with world-class academics working in all aspects of the food area (click here for information on our research themes). Our first-rate facilities include extensive and well equipped laboratories and alarge pilot plant with excellent dairy, meat and bakery facilities, in addition to a unique pilot-scale brewery. Founded in 1845, University College Cork is Ireland’s premier research university and is located in a beautiful Victorian campus renowned for its mature well-wooded grounds close to the centre of Cork, Ireland’s friendly second city. UCC is a progressive and dynamic university of over 14,500 students and is noted for its innovative and research-led curriculum taught by world-class academics. Each year, UCC welcomes over 2000 international students from more than 75 countries into its undergraduate and postgraduate programmes. UCC has been named "Irish University of the Year" for two of the last three years. Why should I do the MSc (Applied Science) in Food Science? that involves novel teaching methods, with emphases on project work and innovative forms of learning. Great career opportunities. The Food Industry is the world's largest manufacturing industry and Irelands largest indigenous manufacturing industry. The Irish food industry is extensive, stable and largely Irish-owned. With a unique blend of scientific and technical skills, graduates of this MSc programme will be well qualified to work in many areas of the Irish and international food industry, including research and development, quality assurance and production management. Other career opportunities for graduates of this programme may include admission to PhD programmes in Food Science and some students with higher degrees in Food Science have transferred their skills to other sectors, particularly the pharmaceutical industry. Don’t get left behind. Remember that nearly 40% of UCC graduates go on to 4th level education (post-graduate study) and that European universities are moving towards a common structure for courses under the Bologna process in which the different European higher education systems will meet at the masters degree. Indeed, in many European countries, the masters is the “standard” university degree. Get a better job and earn more money. Statistics show that students who complete higher degrees earn more money and are much more likely to get a better job. Don’t play “catch-up” when you’re older. As your career progresses, you may find that a higher degree is essential to secure that promotion. Now is the time to do the masters! But most of all…! Do it for yourself! Cap off your university education with an MSc. No matter what your choices, remember that your BSc degree is just a starting point! with honours BSc degree, or equivalent qualification, in a discipline with a significant element of laboratory science, with a minimum of second class honours Grade 2 or equivalent. However, candidates with equivalent academic qualifications may be accepted subject to the approval of Faculty. Graduates from a wide range of disciplines are welcome to apply for admission to this programme, both from within UCC and from elsewhere in Ireland and abroad. Graduates from programmes in Food Science, Food Technology, Nutritional Sciences, Food Business, Microbiology or any discipline within Biological or Chemical Sciences are likely to be considered for admission. Please feel free to contact the programme coordinator if you would like to discuss the entry requirements, particularly if your degree is from a university outside Ireland and you are unsure how your qualification compares with our entry requirements. Candidates are encouraged to apply for this programme as early as possible and the closing date for applications is Sept 1, 2007. Information on the application process is available here. Application for Irish and EU students is now on-line while the International Education Office will process applications from students outside the EU. Please contact the programme coordinator if you experience any difficulties with your application or if you have any question about the process. Candidates will take courses to the value of 90 credits. Modules will be chosen with the approval of the Programme Board depending on students’ background. Students commence work on their library and research projects in October for submission in April and June, respectively. International Education Office and Accommodation Office. Proficiency in English: Non-EU students whose native language is not English or whose undergraduate course was not taught through the medium of English will be required to obtain an IELTS score of 6.0 or higher. The Department of Food and Nutritional Sciences in UCC has a long tradition welcoming overseas students and currently has students from Ireland, Germany, Netherlands, France, China, India, Latvia, Libya, Argentina, Switzerland, New Zealand and Finland visiting our laboratories or studying for higher degrees. Indeed, a high percentage of our graduate students are from outside Ireland so you will feel right at home very quickly! Fees are charged for most postgraduate programmes in Irish universities. Click here for the most up-to-date information on fees. Please note that non-EU students will be required to submit official documentary evidence of financial support before admission to this programme. However, remember that an MSc will increase your earning potential and will pay for itself very quickly when you are in employment! This web site is intended only to give general information about this programme and nothing here supersedes the official UCC College Calendar which should be consulted by all prospective students.